Representatives from the Conarro Family Fund, DeFrees Family Memorial Fund, and local law enforcement gathered recently. 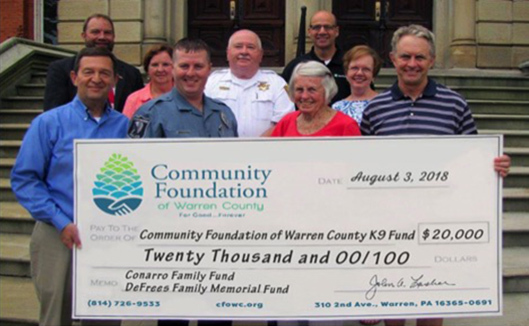 Contributions from these two component funds of the Community Foundation of Warren County went into the K-9 Fund being administered by the Foundation for the benefit of the K-9 Officer Program. The expenses for the first few years of the K-9 Officer Program exceeded $35,000. Although the cost of obtaining a new K-9 Officer may be covered by a grant, the ongoing costs of the program include equipment and training. Tax deductible donations to the K-9 Fund may be made by check payable to the Community Foundation of Warren County with K-9 Fund in the memo line, or online at CFOWC.org. For more information contact the Community Foundation through the website, e-mail to cfwc@westpa.net, by phone at 726-9553, or by visiting the office at 310 Second Avenue. In photo, front left to right: John Lasher, Community Foundation Executive Director; Officer Scott Neiswonger, Conewango Township Police Department; Mary Conarro and Tim Conarro, Conarro Family Fund. In back: District Attorney Rob Greene; Susan Merritt, DeFrees Family Memorial Fund; Sheriff Ken Klakamp; Mike DelPrince and Stephanie Freitag, DeFrees Family Memorial Fund.